Tony Sava has finished his latest Locomotive and its a biggie. Known as the Erie #2602 L-1, this locomotive was the biggest of its kind, back in the day. It also has a very distinct look, which is captured quite well in this creation. Well done, Tony! I have a question. We bought some new lego train tracks for our son for Christmas not realizing everything had changed to RC so the tracks will not work with our 9v set. Is there anyway I can purchase a RC engine and a RC controller separately without having to buy an entire set? I checked ebay with no luck. Thanks. ^ You probably get most of the parts on http://www.Bricklink.com. It seems that most of the parts you need are in the Catalog, under Parts, in the Electric Train category. I don’t know if you can get them all from one seller or not, as I don’t know all the parts that you need. I hope this gives you a starting point. Either that or single bricks from the lego site. ^ Lego doesn’t sell the RC engine and controllers seperately. 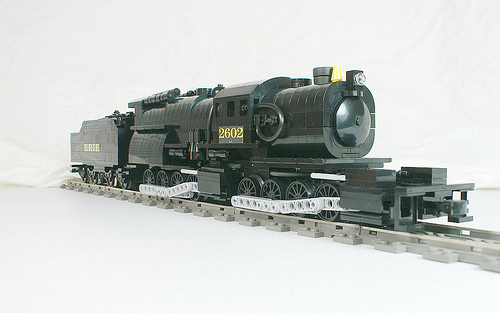 When the new line of trains is released this summer, Lego will sell the RC engine (it will remain unchanged). If your son has any technic using the Power Functions System you can use it to power and remote control your train. You just need to purchase an extension wire and it will work with the old style motors.